Ultimation’s partner for overhead conveyor technology is Jervis B Webb, now a part of the global Daifuku conveyor group. 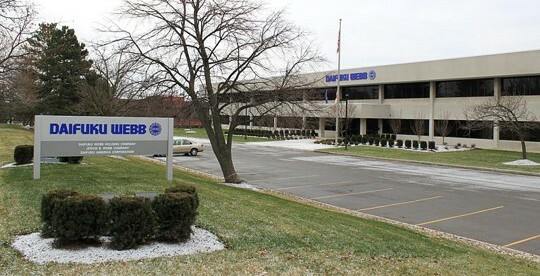 Our alliance with Jervis B Webb began with our first major project in 2012, and now we’re Jervis B Webb’s largest conveyor parts distributor and the largest integrator for Webb conveyor systems in the Midwest. Young engineer Jervis Bennett Webb had a better idea. In 1919 he founded the Jervis B Webb company with the idea of adapting heavy chain conveyors used in the mining industry to suit Detroit’s fast-growing automobile industry. Webb’s breakthrough chain system was different than most conveyor chain. It was rivetless (= stronger), forged (= stronger and lighter) and easily assembled. It could go from slack to tensioned quickly without breaking. 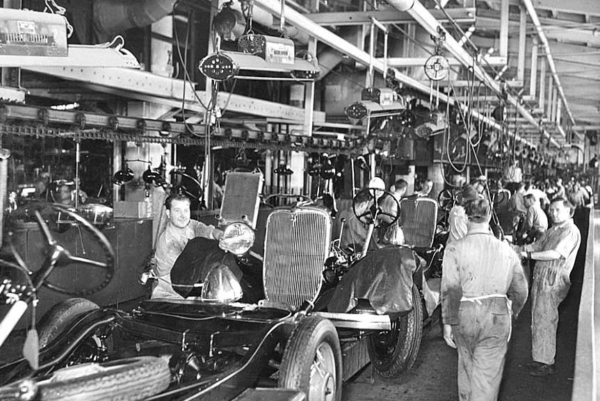 After the first order from Studebaker in 1920, Webb realized that most existing floor-laid chains got in the way of the production process. Webb then hit on the idea of mounting the chain above the working area, and the overhead conveyor as we know it was born. Henry Ford installed the first Jervis B Webb overhead conveyor in the Ford Walkerville, Ontario engine plant. The conveyor was so successful that Henry Ford immediately ordered 30 miles of overhead conveyor from the young but now successful Jervis B Webb! After nearly 100 years as a leader in the conveyor and material handling, the Jervis B Webb company was acquired by a Japanese conglomerate, Daifuku in 2007. Jervis B Webb continues as one of the manufacturing divisions, with conveyor sales, design, service and spare parts for Jervis B Webb conveyors now provided by system integrators like Ultimation. Webb produces the track and the proprietary trolleys, and Ultimation engineers the systems and does the support structure, carriers for the parts, controls, and programming. For nearly a century, Daifuku North America has been at the forefront of the material handling industry developing innovations that have changed the way products are manufactured, moved and warehoused. Their roots began in the automotive industry nearly a century ago when Jervis B Webb adapted the forged rivetless chain conveyor for Henry Ford’s first assembly lines, revolutionizing mass production. 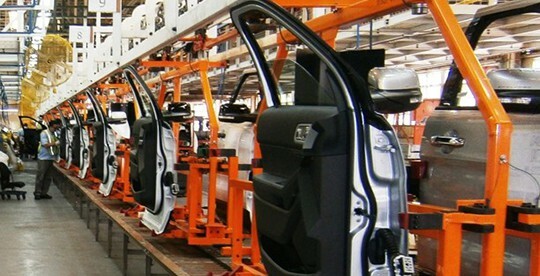 Webb conveyor became the dominant overhead conveyor system used throughout the automotive industry. You can find detailed information on the Ultimation / Jervis B Webb overhead style conveyors available on our website. We categorize them according to the way they move. Hand pushed is the simplest type as they are literally pushed along a track by hand. Motorized Overhead conveyors have one motorized track with a chain while Power and free conveyors are motorized with two tracks. Click on hand push, Overhead or Power and Free conveyor type here as each has their own web page. “Ultimation’s strongest trait was the ability to complete the installation on time, within budget and with no safety incidents to personal or collateral damage to equipment during the installation. They were instrumental in keeping the crew motivated during the arduous installation and they worked second shift in order to meet SWRMC’s production schedule. Wes Paisley, PresidentDearborn Mid-West Conveyor Co.